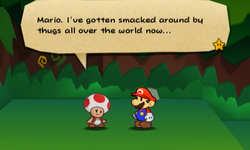 The Traveling Toad is a Toad in Paper Mario: Sticker Star. Throughout Mario's adventures, he is ambushed by enemies while going on "a journey of self-confidence". In a similar manner to Gus and Kent C. Koopa from its predecessors, Mario must bribe the enemies with coins (or fight them, though they usually have a high HP and attack) to get them to run away and leave the Toad alone. After Mario saves him in Jungle Rapids, he gives up and returns to Decalburg, realizing helping revive the Sticker Fest is better than finding self-confidence. Each time this Toad is saved, a postcard is sent to his "bud" ("Mate" in the PAL version). If Mario reads the fifth one, his friend will burst into tears and give Mario an HP-Up Heart. In the parade, he is seen on the World 5 float, with all the enemies that attacked him. My journey is fraught with danger. I was lately accosted by some flimsy Goombas bent on mischief, but I dispatched them with ease. They cried, "Forgive us, mighty Toad!" and left me 20 coins. Satisfactory! Pray tell, what is better than a coin well earned with knuckles? Naught! In any case, my journey continues. Will write when circumstances permit. In the unrelenting heat of the desert, tensions mount and the spirit quails. Yet this Toad presses on! Huzzah! The comforting strums of guitars seem omnipresent, a pleasing backdrop to the shimmering vistas of both pyramid and sphinx. All melts into a mirage dream. As I trod the sands, I treated some local children to a cold beverage. How lovely such chance meetings are! We are all strangers in a strange world! My ears, once clogged with the words of men, now hear all. If one listens closely, one can hear the voice of the woods. I had tired of the hubbub of town life. I had come to wonder, what is a Toad? And so I embarked on this epic journey. Yes, a journey to find myself. I've come to realize that a Toad must learn his limits. He must dispose of his worldly desires. And most of all, he must be content with his inner Toad. My inner Toad is more than content. He is mighty. Poison surrounds me, but I fear not its acid bite. I shall donate my Shiny Mushroom sticker to one in need. My great journey of self-discovery continues. I will write soon. My body, this crude vessel, is so cold...but my spirit is ablaze. So many attractions command my eye. Such a wealth of entertainment calls to me that I quite lose track of time. The tickets are rather on the expensive side, but the visions I have witnessed are worth any price. I cannot tarry, however. A land of pure, untamed wilderness lies ahead of me. Pray tell, what chance encounters lie in wait for me there? The mountains rise up to greet me as I set out on the next leg of my journey. Until next time. Confession time: I've been getting whupped up and down two continents, and I've been saved time and again by a fellow traveler. Those whuppings opened my eyes, bud. And I know now my mission in life. I've got to do my part to help Princess Peach! She needs us all to try our best! I have no idea if I'll make it back in time to help revive the Sticker Fest, but I'll try my darnedest! I'll make the princess proud if it's the last thing I do! Until then, I remain your bud. This page was last edited on February 7, 2019, at 02:39.